Custom tuning on the Adrenaline units targeting the 1998.5 to 2002 Dodge with Cummins Engines is divided into two sections. Most Adrenaline units currently out in the world have the original custom tuning features (now called Legacy V1 tuning) enabled. Quadzilla units began shipping with V2 custom tuning in late 2017. This new V2 custom tuning enables more custom tuning to be done on your truck than ever before. Many Thanks go out to mopar1973man.com and to Me78569 on that site for compiling this custom tuning guide. Find his original Quadzilla Custom Tuning guide here. You must have a V2 base tune loaded for these to work along with selecting the V2 vehicle out of the iQuad Vehicle Selection list. One will not work without the other. V2 of the custom tuning is the next level of custom tuning for the Quadzilla Adrenaline and the VP44 powered Dodge RAM with 5.9L Cummins 2nd Gen truck. Take complete control of how your truck is fueled from bottom to top and add in timing controls never seen in these trucks. Make all of these changes on the fly and then you can start to imagine what the V2 level of customization can give you. This section contains the parameters used to customize the tune settings (rather than the tuning itself). This parameter determines the number of power levels that you can step through to get to the maximum power level. More numbers means smaller incremental steps in power, less numbers means larger power steps size. 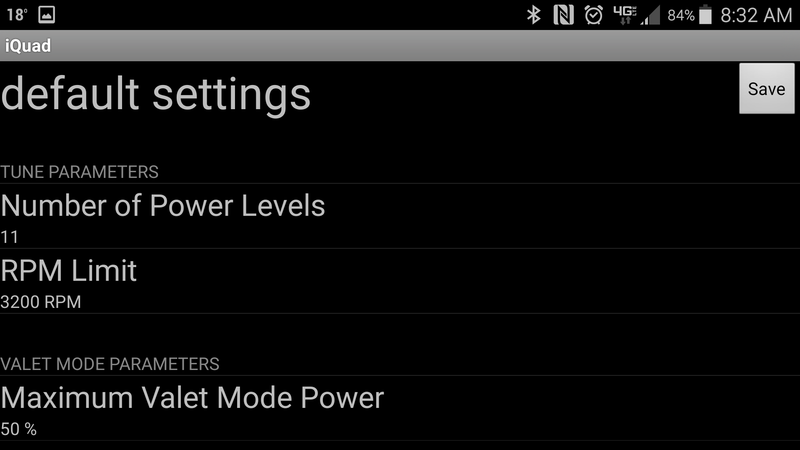 Quadzilla has introduced a new power level called "power reduction" or "Valet-Mode" as the new lvl 1. As a result, all V1 tuning levels are moved up one, Lvl 3, CAN bus, has also been modified to allow for on the fly user based custom tuning. PL02: Timing / MPG mode with Custom user CAN bus for 0-10psi. Over 10 psi is possible, but only using the 10psi scaling % in the custom tuning. PL04 +: Wiretap + CAN bus + Timing. The more levels you have the smaller the jump in power per level. If you have 7 power levels (PL00 through PL06), then PL04 will be %33 wiretap PL05 will be 66% wiretap and PL06 will be full wiretap. Because of the additional power level we have increased the minimum number of power levels to 6 rather than 5 and the upper limit to 15 rather than 14. Limit to where you would like to stop fueling. PL01 maximum power level. This power reducing level is designed to allow others to drive your vehicle without any worry of them pushing too much power and making a fool of themselves, your truck, and you (for letting them use it). Using custom tuning you can set the OEM fueling to anything between 0 and 100% of stock. With 100 hp injectors setting this to %80 gives good power without smoke, 70% will put the same truck back to near stock fueling for a 235 HP truck. It can also serve as a valuable anti-theft mode. Using the custom tuning you can set this level to 35% and the truck will hardly move and be limited to basically idle, setting it to 15% will cause the truck to stall when the throttle is applied. This section contains the parameters dealing with the pump tap only. 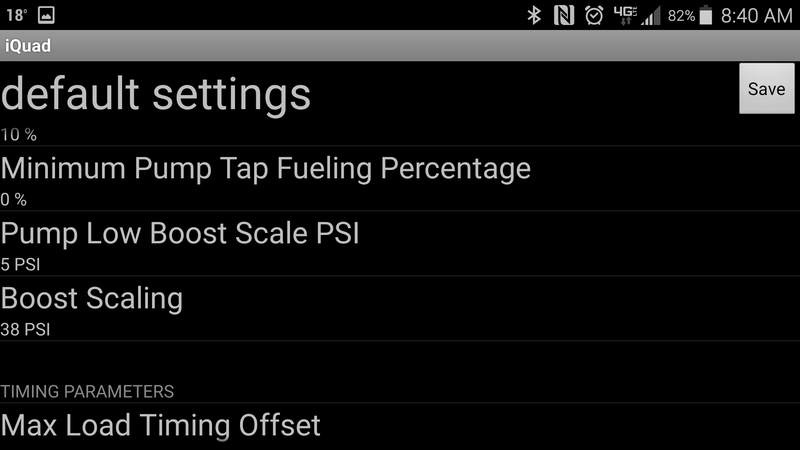 Modifying these parameters will only change the way the pump tap fuels. The max fuel stretch is the maximum amount of time the Adrenaline will stretch the pump signal through the wire tap. This will give you the biggest difference in overall power and smoke. Default in the standard tunes is 1400 with some trucks needing a maximum of 1200. This is the bulk of the extra power. This is the maximum based off RPM, boost, APPS (also called TPS or throttle position), and power level among other things. Setting Max Pump Stretch higher may reduce total power while increasing Torque under the curve. If you want upper-end power you would not want to set this to the max. If you want low-end torque you would set this higher. Typically people find that 1600-2000 is the happy spot depending on your injector size and driving style. Smoke output will be increased by setting Stretch higher. 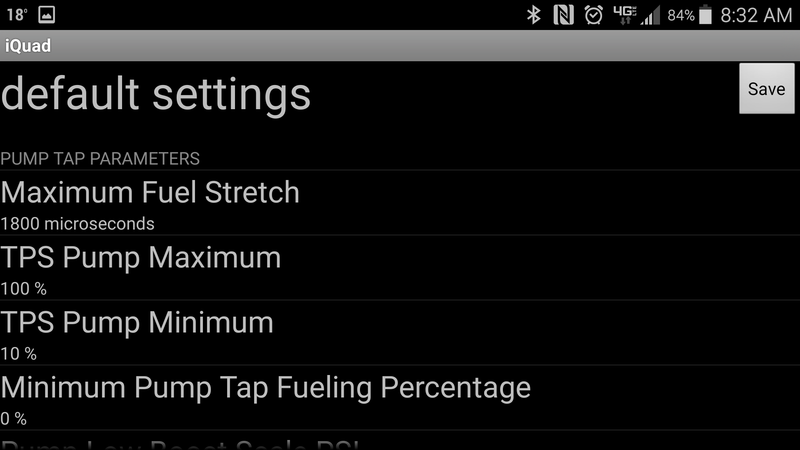 This allows for you to set the upper limit for TPS input for wiretap fueling. Wiretap fueling does not stop at this point, rather it peaks at this point. Using the max and min settings you can move the wiretap fueling area around within the 0-100% TPS range. This allows for you to set the lower limit for TPS input for wiretap fueling. Wiretap fueling will not start until this point is reached. Using the max and min settings you can move the wiretap fueling area around within the 0-100% TPS range. This Tuning variable is to set a low limit % for wiretap. Caution should be used when setting this setting in your custom tune. If you set it at 25% you will get no less than 25% of wiretap at any point in the map. Setting this high will make the truck smoke, but can be useful when creating a Race tune. Normal DD tunes should likely use 5% or less. Smoke free tunes should use 0%. This set the low limit for the wiretap fueling map. If you set this at 0 your wiretap will begin at 0psi. If you set this at 15 your wiretap map will start at 15 psi. Set this variable to whatever PSI you want Wiretap to begin fueling. ** Please note that Boost Scaling cannot be set lower than this setting. The ADR will add 5 psi to the Boost Scaling if you set them the same. 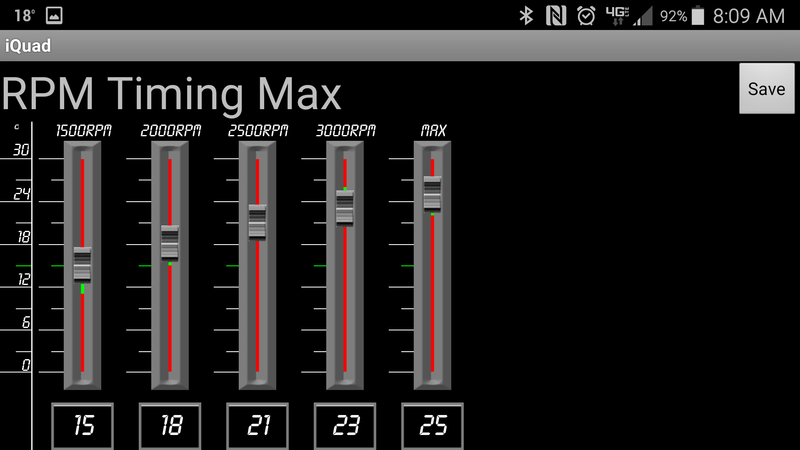 This allows for you to set the upper limit for Boost input for wiretap fueling. Setting this to 20 will give you full fueling at 20psi, assuming tps min / and maxes and other conditions are met. Boost scaling is calculated along with TPS scaling and other factors so in order to have 100% of fueling all input conditions need to be met. V2 Custom tuning has greatly expanded the set of timing parameters that can be modified. The following parameters are the modifications to the RPM timing Max section detailed below. This new timing tuning will give you a significant amount of control over timing compared to other tuners on the market. This is a setting that allows up to 3* of RPM timing to be based on load. This allows you to tune timing based on a bilinear calculation based on load and rpm. 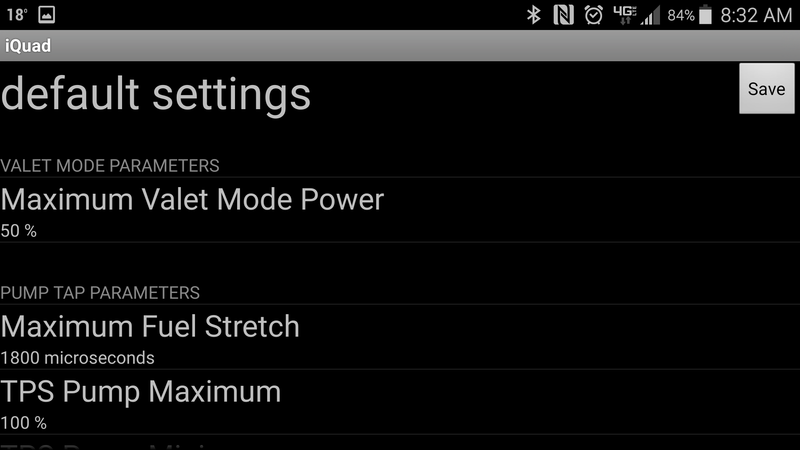 This setting does not increase your max timing, rather it puts weight on Load. IE: if your rpm was 2000 and your max timing for 2000 was set at 19*, your load timing was set at 3* and you are at 50% throttle, then you would get ~50% of load timing ( 1.5*) which would put your current timing at 17.5* ( 19* max - 3 + 1.5* = 17.5*). Where as if you were at 100% throttle then you would get the full 19* of timing at 2000 RPM. To extend the example a 30% load, would give you 30% of 3*30% = .9* so at 2000 rpm you would have 17.9* of timing if load was at 30%. Variable to allow for the user to set a max amount of timing to pull when TPS is high and boost is low. Pulling timing will assist in spooling the turbo. This allows you to set how much timing gets pulled from the Low PSI timing reduct number set. You may want more timing down low, but want to pull timing up top. Scaling function will limit max timing but allow for the map to calculate off of the max timing until that point is reached. IE: if timing reduction is set to 5* and scaling is set at %50 you will get a max reduction of 2.5* ( 5 * .50 = 2.5) but if the map calls from %50 you will get 2.5* at %50. It will effectively allow for you to reach your max sooner. This setting allows you to advance timing above the base timing curve if load is low. Timing advancement is based on load % where %0 load would give you the most timing advance and as load increases timing will decrease. Above 50 mph there is an additional 1* of timing added on top of the configured value. Most setups should run a value of between 0.5* to 2.5* of timing advance. This setting will require some adjustment based off EGT values at cruise state. Find the setting where EGTs are most reduced. -Generally speaking 17.5* to 18.5* of timing is optimal for best MPG while at cruise at 55-65 mph. -Generally speaking 18.5* to 19.5* of timing is optimal for best MPG while at cruise at 70-80 mph. -Tow tunes should use a cruise timing advance of 0.5* to 1* unless studs are in place. -If you have headstuds you can add more Light Load Timing for reaching the max MPG. 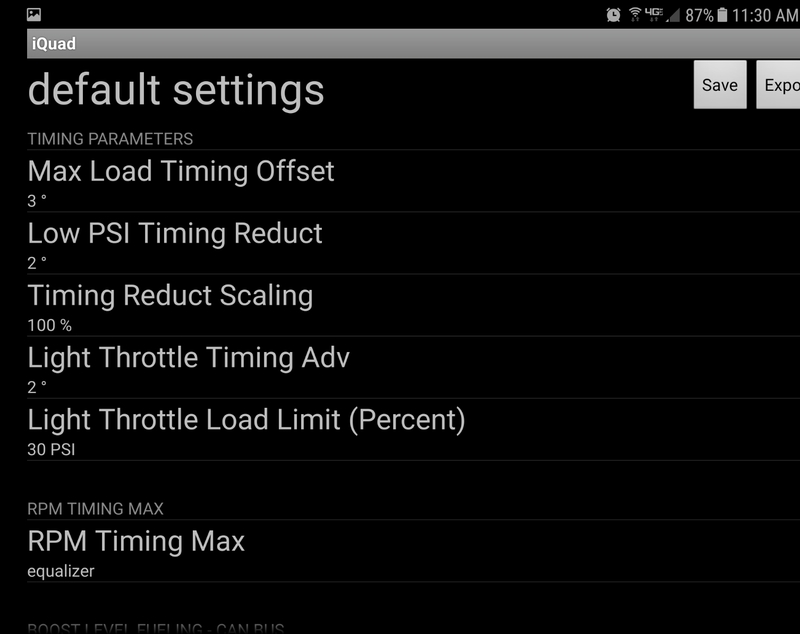 This setting allows you to set a maximum value for engine load for light throttle timing advance. If engine load is above this level, the truck will no longer use light throttle timing. ** please note that setting timing higher than suggested may lead to headgasket issues, please ensure you have supporting mods, IE studs, before venturing outside of the recommendation. This is the most control over your tuning that is available on the market. In the Custom tuning menu, there are an addition 25 new Custom tuning variables that allow you to set a % of power level above or below stock. The range for this is %50 - %150 You will need to configure this for each psi leading up to 30psi. From 0-16psi is a % per psi above 16 psi is % for 2 psi. It is possible to tune any truck with any injectors to be very clean. Typically ~%70 is the lowest usable % and %130 is the highest, but this will differ from truck to truck. Truck with near stock sized injectors will typically set this number above 100% increasing as the PSI increases, trucks with large injectors can set low PSI scaling under %100 to clean up off boost fueling. You will notice some increase in lag due to this, but you are able to make fine adjustments to get power where you want it throughout the power range. To run stock, set all values to 100%. THIS WILL TAKE SOME FINE TUNING ON YOUR PART FOR BEST RESULTS. MAKE %1 CHANGES ON EACH PSI LEVEL. IN MOST CASES YOU SHOULD NOT MAKE A JUMP OF MORE THAN %5 GOING FROM PSI TO PSI. THE HIGHER THE JUMP IN % THE MORE AGGRESSIVE THE QUADZILLA WILL RAMP UP FUELING. When you are starting to use V2 Tune on your truck you should follow these steps. This tuning should not be done on busy roads or in any place that risk of crashing or hurting others. A closed track or a back country road with good visibility is recommended. Save your tune after EVERY change. Don't forget you are able to create more than one custom tune so you can setup a race tune or tow tune or DD tune. Tune your custom tunes with something in mind. Don't try to make the truck do everything on one tune. If you have stock injectors you can set this to 100% or above so you can skip this step and move to Step 2. Use LVL1 and the Power reduction % to find a good point for the CAN bus fueling %. For 50 hp injectors start at %95 and move up or down by %1 depending on if you get smoke when you snap throttle from 0-%50 while in gear. Find a reasonable % for smoke output vs low-end power. Remember this is to handle off idle power. Good starting points per injector size ***use only as a guide you will need to go through some trial and error. Once you have found a good starting point Set your 0 PSI % to this power reduction % and set your Power Reduction scale to a % that you want to allow for a valet mode or anti-theft or whatever other reason for reduced power. Once you have a good starting point defined for 0 psi scaling increase every % by 1 as you move up in psi. As you hit 10-15 psi you can move up by 2 or 3 % per psi until you max out at ~%130. You will notice that the CAN bus HP limit is somewhere around %130 depending on the truck and the mods. This should give you a good base fueling map to fine tune your truck by. Once you have your base map do some 0-%50 APPS take off's on LVL3 only. Pay attention to Boost numbers and smoke output. a video camera is very helpful. ENSURE YOU ARE NOT AROUND OTHER DRIVERS OR PEOPLE WHEN DOING THIS!!!!!! You may notice puffs of smoke as PSI climbs, reduce the % at that psi point by 1 if smoke is too much. If the truck feels laggy at a given PSIincrease by %1 until your truck feels good. Keep in mind that smoke from the tailpipe may cause flooding of the turbo. A truck will respond best when there is a slight haze under high throttle input. Don't be afraid to use high TPS input to get the truck moving. That is what the throttle pedal is for! Once you have your CAN bus tuning done move to wiretap tuning. Wiretap fueling will increase power significantly when it is used. Depending on your wants you can set low limit fueling for wiretap. This will allow for smoke reduction when wiretap comes on. Set your low limit for a PSI that is above your normal DD / cruising PSI. IE if you drive to work every day and don't normally hit 10 psi set your low limit above 10 psi. If you want wiretap fueling when you typically drive set the low limit below that. I would not recommend setting this below 5psi as smoke control is much harder. Remember low limit allows for wiretap scaling below that point. TPS min also comes into play so set your pump TPS min at a point that makes sense for your driving style / needs. For best fuel mileage, set the TPS min point at a point that is higher than your cruising pedal position. Once you have set your low limit for Wiretap fueling set your scaling. This scaling will set how much wiretap fueling is added before the low limit is reached. If you want no wiretap before the low limit set this to %0, if you want half set this to %50 and so forth. Setting this at a higher point will result in a sudden increase in power. Typically I leave this between %15 and %25 depending on how aggressive you want the truck to feel when DD'ing the truck. Setting this % higher will increase smoke output off idle. Modify the boost scale to a position that is above the pump low boost scale by at least 5 psi, more is recommended. Setting the boost scale too low will result in very compressed fuel map. Visit this thread for a list of Users custom tunes. Check out our user submitted video of how to do the custom tuning! Think you can make a better one? Go ahead and submit it to us and we'll post it. Many Thanks Nick. Its great! Unfortunately, that video is really hard to watch because it was inadvertently flipped horizontally and sometimes vertically. Here is our attempt and making something similar. This number determines the number of power levels that you can step through to get to the maximum power level. More numbers means smaller incremental steps in power, less numbers means larger power steps size. However, the first three power levels are always the same. PL00 is always stock with boost fooling. PL01 is always timing only/max mileage. PL03+ is where the fuel stretch is used. If you choose to have only 5 power levels, you will have the first three power levels that are constant, plus 2 fuel stretching levels. The first with a maximum of 50% stretching and the second with a maximum of 100% stretching. The default is to have the power numbers set to 11 thereby giving you power levels 0 – 10. With the number of power levels set to 11, you will have the default 3 levels + 8 levels of fuel stretching. Those eight levels will give a step size of 12.5% of fuel stretching per level. Of course, the actual fuel stretching that takes place is more complicated than just setting the power level, we also take into consideration the boost pressure, the Throttle Position Sensor (TPS) level, and the RPM. This is simply the maximum amount of added degrees of timing. This is mapped and you will get anything from 0 to this limit of added timing. It is recommended to never go over 8.0° degrees of timing. If you are going for mileage only and are going to be real easy on the power you can increase this to 10°. Going this high with your timing can possibly cause head gasket damage under much boost. This allows you to set a higher degree of timing (say 10°) but scale it down to this percentage (say 75% for a max degree of added timing of 7.5°). However, as the timing gets divided down into lower levels you will still get more advanced timing on the lower levels and max out at a peak of the scaling. You will get more timing on the lower power levels, but will limit the timing on the upper levels. The max fuel stretch is the maximum amount of time the adrenaline will stretch the pump signal through the wire tap. This will give you the biggest difference in overall power and smoke. The default 1000 tune has this set pretty small. On the comp tune this is set to 1800. Any more than 1800 creates more torque and more smoke, but actually give less power on the upper end. This has been tested on several trucks on the dyno. However, feel free to set this to 2400 and get a lot of low end power and smoke but know you are loosing power on the upper end. A good place to set this is around 1200 to start with. This also applies to the TPS Can Maximum. This is the position of the throttle position sensor which will result in maximum output values. In other words, anything other than 100% will shrink the range your throttle pedal needs to travel in order to put out 100% power. If you set this to 80%, at 80% of the Throttle Position Sensor you will 100% of your fuel stretching. This is normally set to 100%. This makes the throttle lighter and more responsive. This is the minimum amount of fuel map for the pump that you will ever get. If the map calls for 100% but you are at 5% throttle, normally you will get 5% of the fuel stretching. However, if you have this value set to 10%, you will get 10% of the fuel stretching. You have to be careful with this parameter or you will be fueling way too much at light throttle. This is normally set to 0%. This is just like the TPS Pump Maximum. This is the position of the throttle that will give you 100% of the CAN bus fuel map. This is just like the TPS Pump Minimum. This is the minimum amount of fueling that will ever be added to the CAN bus fueling. This can act as a smoothing function of the map. This sets the amount of boost pressure needed to advance the map into the next section or column of the map. There are 20 columns in the map that determine the fueling. If you have this number set to 20PSI, then an increase of 1PSI will advance the map into the next column. If you have this number set to 40PSI then the boost pressure will need to increase 2PSI to advance to the next column. This is also the boost pressure that will result in the maximum output value of the fuel map. With this information, you can make and more informed decision on how to adjust your custom tunes to make the most of your tuck. Want to use some user's submitted example tunes? Check them out below. Quadzilla Power, LLC does not support any of these tunes. *For more low end, move maxs to 70 and mins to 0.